In small bowl, combine peanut butter and honey; mix well. Partially stir in cream cheese to give a swirl effect. Spread mixture on 4 slices of bread. Top each with strawberries. Cover with remaining bread slices. Use your favorite fruit-flavored cream cheese in place of the strawberry-flavored cream cheese in this recipe. Or try plain cream cheese. 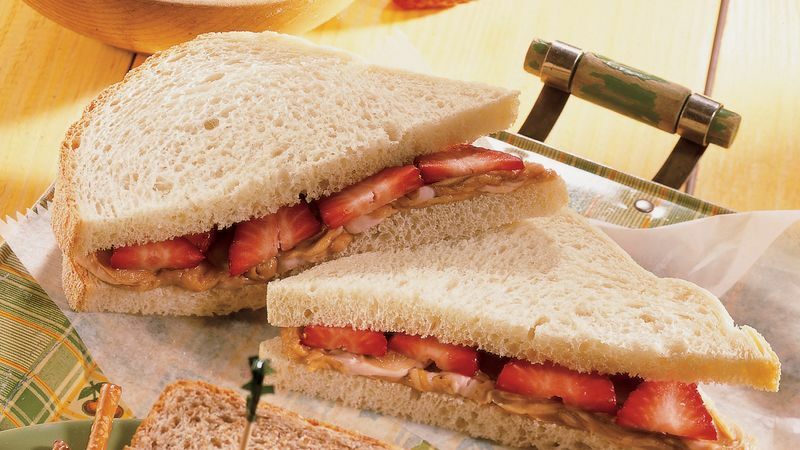 To reduce the fat in each sandwich by about 9 grams, use reduced-fat peanut butter and fat-free strawberry cream cheese in place of the regular products. These sweet sandwiches taste great with pretzel sticks and cold milk. For dessert, offer oatmeal-raisin cookies.